Attributes are comprised of 3 elements: 1)TAG, 2)PROMPT, 3)DEFAULT. * No spaces allowed or characters. PROMPT – Usually a question that asks the user for inupt. * Check the Align checkbox when placing ATTs after the first Att is placed. 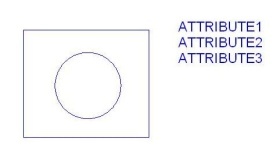 REMINDER – The Picture below shows that there are 3 ATTs. that are attached to the block. And each ATT. consists of the 3 main elements. This will keep your ATTs lined up nicely. Constant – check this if the Default is already set and needs to stay the same. Verify – Asks the same question (prompt) twice. This is good for double-checking but also annoying. Lock Position – unchecked, will allow the ATT to move independently of the block. When making a block of the ATTs and objects, DO NOT use a window to select everything. This will reverse the order that the ATTs will prompt. Instead, select each ATT individually in the desired order, then use a window to select the objects. BATTMAN Edits the main three (TAG, PROMPT & DEFAULT) and allows changes to be made to the order of prompts. 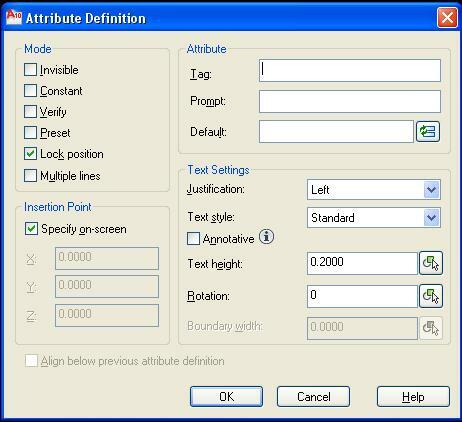 GATTE Global Attribute Editor – can either select an ATT or enter the name of the ATT or block. Data Extraction allows you to do a number of things with the data that you pull out of the drawing. The most common uses are 1) creating a table that is placed within the drawing. 2) creating an excel spreadsheet with the extracted data. 1) Check the “Create New data extraction” for a new extraction. The option below it (Use previous…) is for when you have already weeded through what information you want to extract, and placed a table…. You can use those settings for this data extraction. 2) DEFINE DATA SOURCE – Select what drawings to extract data from OR Select individual objects from a single drawing. 3) SELECT OBJECTS – Check or uncheck objects to extract their data. Since we created ATTs, lets uncheck everything in the “Object” column except for the “Attribute Definition.” * An easy way to uncheck all is to right click and select “uncheck all” then check the items that you do want checked. In the lower “Display Options” portion – uncheck the “Display all objects” box and then make sure that “Display blocks only” is selected. This way we don’t see every item in the drawing. We can now select the blocks in the drawing. 4) SELECT PROPERTIES – on the right side portion (category filter), right click and select “uncheck all” and then check the “Attribute” filter. Now in the left (main) box (properties), you can weed out what Attributes you do want or don’t want to extract. 5) REFINE DATA – This is a preview of how the data will be sorted. You can drag the columns to the order that you want it display. 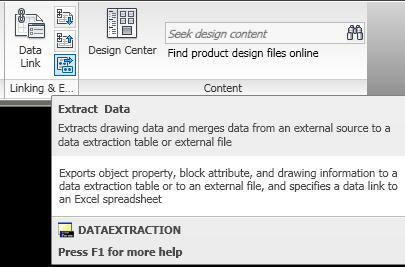 Advanced – If you have a spread sheet that you want this data extraction info to go into, select the “link external data” button and find the file that you want to link this data to. 6) CHOOSE OUTPUT – 1st checkbox = placing a table of the extracted data into the drawing. 2nd checkbox = creating a NEW Text (.txt) file or Excel (.xls) file from the extracted data. Both boxes can be checked at the same time. For the 2nd checkbox, give the new file a name, file format (.txt or .xls) and specify a folder where the new file will be placed. 7) TABLE STYLE – If you already have a table style setup, you can select this as a template for the new table that you are creating. Otherwise, enter a name for the Title of your table. 8) FINISH – simply click finish to place the table in the drawing and/or create the new file. At this point you can also hit the BACK button to make any changes before placing the table. After placing the table within the drawing, if you insert more blocks or delete blocks that are listed in the table, simply select the table, then right click and select “Update table data links” and the table in the drawing will be updated with the new total. In the picture above, these are copies of the same block. They have both been exploded. The block on the left has been exploded using EXPLODE or X and the block on the right has been exploded using BURST and has kept its values visible. This entry was posted in Attributes, BASICS. Bookmark the permalink. Thanx for al the info on your site. I got a question about the data extraction. I have made a block with information like art.number, drawing number, description. When I check “constant” in the attribute defenition, it wont show in my excel sheet. Am I doing somethin wrong? I use “export attributes to do this. I just upgraded to ACAD 2012 from ACAD 2011. The Data extraction worked well in 2011 but not in 2012. I am trying to extract data from title blocks in multiple drawings and then manipulate the data. In 2011 I selected multiple file and the atributes I wanted and got a table with all the data from each drawing. In 2012 I tried the same thing only now I get the data from the opened drawing and repeated for all the drawings. I am at a loss as to what is going on?